Told that Brady Tkachuk will return to BU for his sophomore season. The Terriers were going after a grad transfer who was told the offer was no longer available due to Tkachuk returning. Cawlidge Hawkey Insider also Tweeted that Tkachuk plans to return for his sophomore season. Much will depend, of course, on the intentions of the team that drafts the 6’3” forward. 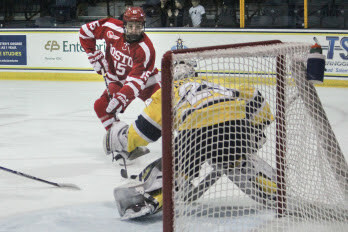 The Providence Journal’s Mark Divver Tweeted that Brown University forward Max Willman, a 2014 fifth-round draft pick of the Sabres, will join the Terriers as a graduate transfer. Shane Bowers talked with his hometown newspaper about his freshman season, calling it a "huge success from a development standpoint." 2018 recruit Joel Farabee finished his NTDP U18 season with 76 points (33G, 43A), second best on the team, earning a silver medal in the IIHF World U18s to go with the gold he won at that tournament a year ago. Donovan Sebrango was taken at #32 overall in the Phase 1 USHL Draft by the Waterloo Black Hawks. Last season, the defenseman from Kingston, Ontario played for CIH Academy White Midget AAA with another 2020 recruit, forward Dylan Peterson. He scored 25 points in 30 games, and was named to Team HEO for the OHL Cup tournament. Fellow 2020 recruit Josh Lawrence was selected in the eighth round by Des Moines; however, hockey journalist Jeff Cox reports that the Fredricton, New Brunswick native will play in the BCHL next season for the Penticton Vees. 2018 recruit Ryan O’Connell played for the Vees last year and both Dante Fabbro and Ty Amonte are Vees’ alumni. Last season, Lawrence had a 27-56-83 line for the Selects Hockey Academy 16U. Alex Chiasson scored his first playoff goal of the season in Washington’s 2-1 overtime win that eliminated Pittsburgh, four games to two. The Penguins, under the leadership of former BU captain Mike Sullivan, had won the previous two Stanley Cup championships. Brian Strait, an assistant captain on BU’s 2009 national championship team, was re-signed by the NJ Devils to a two-year, two-way contract. Strait, who has played 187 regular-season NHL games and 16 Stanley Cup playoff games with Pittsburgh, the Islanders and Winnipeg, spent last season with the Devils’ AHL affiliate, Binghamton. Charlie McAvoy will join Team USA at the IIHF World Championships in Denmark, bolstering the team's defense corp. He scored 32 points in 63 games for the Bruins during the regular season. Team USA plays Latvia today in preliminary round action.